July 20, 2017, New Delhi, India- Visas Avenue Annual Conference- 2017 took place in Radisson Blu Hotel, Dwarka, Delhi from 16th to 18th July 2017. The conference was a great success as all the branches of Visas Avenue participated in the conference and the subsequent events occurred. Let’s take a look at the key highlights of the Annual Meet and Conference of the leading Visa Consultancy Company of India. It was the grand occasion for the whole Visas Avenue group as employees from Delhi, Mumbai, Bangalore and Hyderabad branches of Visas Avenue came all the way to Radisson Blu Hotel, Dwarka, Delhi to be part of this event. The Conference began with the inauguration speech by Visas Avenue CEO, Ms. Deepti Saxena and Director, Mr. Manish Arora. Following the inauguration speech, Business Head, Ms. Rashmi Sinha briefed the whole gathering about journey, goals and objectives of Visas Avenue through a concise, but momentous Presentation. Later, question and answer round held wherein the people asked questions about the process division, etc. In the evening, all the Branch Managers of Visas Avenue conferred their views about their branch, company and about the future objectives. The award distribution to the Star Performers of the Company conducted later in the evening. Fashion Show: The employees from different Visas Avenue branches participated in the Fashion show. Later, the award of Mr. and Ms. Visas Avenue was given to the winners. Visas Avenue Got Talent (VAGT): An exciting event with title ‘Visas Avenue Got Talent (VAGT)’ was held 2nd day of the conference, wherein, participants presented their various talents, i.e. Singing, Dance, Play, Mimicry, Spoof, etc. Subsequently, awards were distributed to the winners. Gala Night: The Annual Conference ended with a glittering Gala Night, wherein everyone hit the dance floor. The party continued till the middle of the night. At the end of the dance and party, all the branch managers thanked the management for organizing such wonderful event and praised their grand gesture for the whole team. Finally, it was an end of grand and successful team event, i.e. 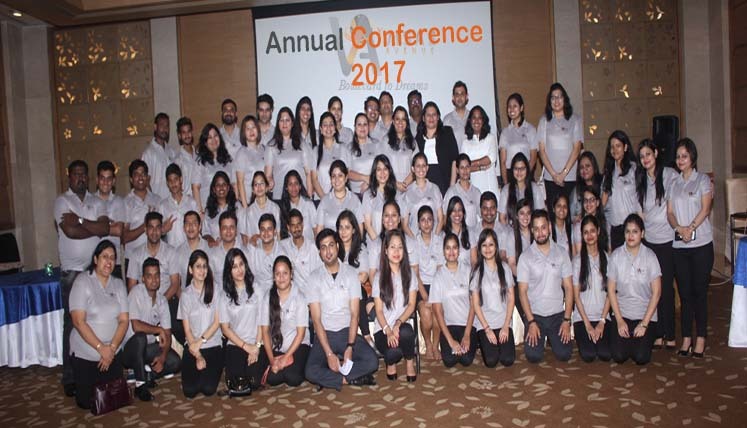 Visas Avenue Annual Conference-2017, which would be remembered for a long by the team members for its team spirit, sharing of experiences, discussion about goals and objectives, along with fun, events, activities, and of course a grand gala night.